Home » Travel & Leisure » Senior Guide to Komodo Liveaboard Trip! Senior Guide to Komodo Liveaboard Trip! By Brandon Lopez in Travel & Leisure on February 4, 2019 . Nothing says that Komodo liveaboard trip is reserved only for the young and adventurous. Now that you have retired and comfortable, no one can hold you from travelling and sailing the world—including the raw and remote Komodo National Park, Labuan Bajo, Flores. Here are some basic guide that would be helpful for seniors who desire to sail in this frontier. You have passed almost entire phases of life and you know very well how energetic younger crowds can be. When you are sailing with younger adventurers, you might have conflict of interest. 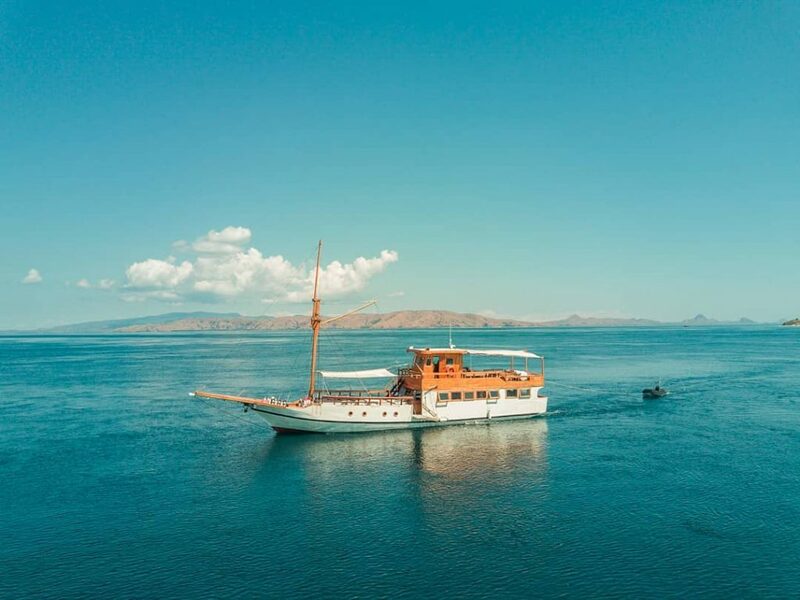 What you think of enjoying Komodo might include taking time absorbing one place to the fullest, having lunch by the water, and spend the day leisurely sailing across the Flores Sea and enjoying the scenery. On the other side, younger generation’s definition of exploring the Komodo would often means cramming as many destination as possible in one day, have one activities quickly followed by another, and won’t rest until the stars out. For them, true Komodo holiday would be dive, trek, eat, sleep, repeat. Often times, the fun won’t die intimate at night—time when you might preferably spend by resting without disturbance. Unless you have frequently on long trip with young groups of travelers, we highly suggest you to take private Komodo liveaboard if you can afford it. Chartering a liveaboard gives you undisturbed privacy and flexibility that won’t be available in open trip. You are even free to change the itinerary on sudden notice should your health condition need it. And the best of it all, there are no nosy teens to irritate your leisure sailing trip. When you have passed the peak of your prime health, you might want to have more relaxed adventure. On the other side, the rugged landscape of Komodo strongly suggest lost of exploration—which obviously needs a lot of physical work. To avoid putting too much strain to your body, we highly suggest you to limit hiking, snorkelling, or diving to just once per day. Take more time chilling around Komodo’s beautiful beaches, leisurely swim in the shallow water, and just enjoying the vibe from the comforts of your liveaboard. Oh, we all know the joy of food when it comes to senior age. Especially when you have many to watch—sugars, fat, cholesterol, certain seafood (some liveaboard cook fresh clams, shrimps, and sushi), and other certain foods you need to watch. As the Komodo liveaboard crew would be the one who cook your food during the trip, give them all the details. If necessary, hand them your personal low-calories sugars to make things easier. This seems simple—after all, this might one of the most common advice for senior citizen to liveaboard trip. Following the model of Indonesian’s wooden ‘phinisi’ schooner, your Komodo liveaboard is full of narrow gangways and steep staircases. This seemingly super-simple advice, however, turns out to be the most challenging one. Over the years, we have seen many—experienced and inexperienced—fall to victim of the staircases. It’s very important to be extra careful 24/7, particularly when you just enter the liveaboard just after dive or beach play. Just because you are on your holiday doesn’t mean you can forget your medication. Put reminder when to register the meds and consult to your doctor whether you should adjust it with the local time to keep sticking to your biological hours.